Everything's in first-person. Your silent hero is equipped with a high-tech gadget that can manipulate chunks of the environment. You progress through a series of rooms, each stuffed to the brim with quirky crate-and-button-based puzzles that need solving. And an omniscient voice is talking to you the whole time. Stop me if you've heard this before. You probably have. It's Portal. But it's also Quantum Conundrum. Quantum Conundrum, a Square Enix-published title that will be out for Xbox Live, PC, and PlayStation Network this summer, feels like a natural successor to Valve's critically-acclaimed puzzle game. It feels like what the designer of Portal would make next. This makes sense, because it is what the designer of Portal made next. 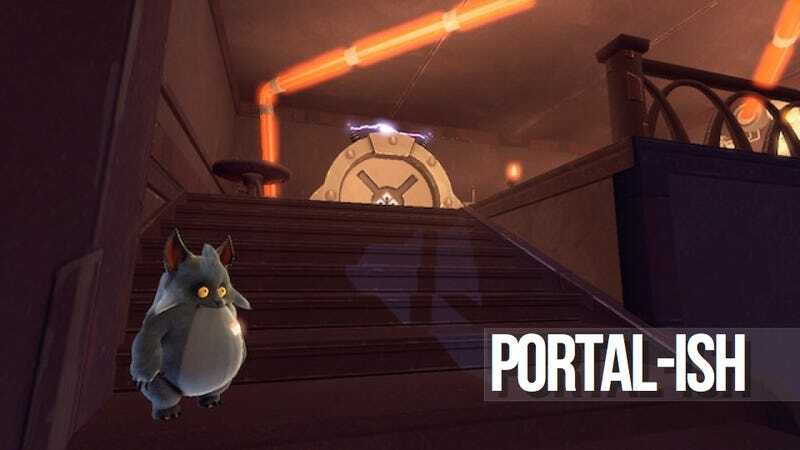 Quantum Conundrum is the brainchild of Portal lead Kim Swift, who left Valve for development studio Airtight Games back in 2009. It's a first-person puzzler about a twelve-year-old boy (you) exploring a mansion laboratory belonging to his uncle, Professor Fitz Quadwrangle (the omniscient voice). You have to get through the mansion and rescue the professor from the dimension he's accidentally trapped himself in. To solve the mansion's puzzles, you can flip between four dimensions: Fluffy, Heavy, Slow Motion, and a fourth mystery dimension I didn't get to see. Each dimension has properties that affect the objects around you. Fluffy makes everything lighter. Heavy makes everything heavier. Slow Motion... well, you can figure that one out. Say there's a safe on the ground and a window in front of you. You can switch to the Fluffy dimension to make the safe light enough to pick up, hurl it at the window, and quickly flip to Heavy so it shatters the glass and you can get inside. Say you need to get through the rapidly-spinning blades of an oversized fan. Just switch to Slow Motion and they morph into an inviting door. Say you need to turn four towers of evenly-stacked crates into one downward staircase. Just turn on the laser beam that swings back and forth from crate to crate. Swap to Fluffy when you want to evaporate a crate, lowering each tower. Use Heavy when you want to protect crates from the laser and keep each tower level. Repeat. Voilà. Stairs. It's a clever, delightful system that, much like Portal, seems to get tougher and tougher as you go through each level. And from what I've seen so far, each of those levels is rewarding as hell. Some time after seeing Quantum Conundrum, I was wandering around the PAX East show floor and ran into Chris Kohler, Wired.com Game|Life editor and my former boss. "Have you played Quantum Conundrum?" I asked him. "It's friggin' awesome." "[It] demos very well," Kohler said. "Then again, I've played many games that didn't turn out as awesome as the demo. So it's important to always bear that in mind before you say 'it's a good game.' It's a good demo. Only the game can answer that question." A wise point. So while Quantum Conundrum certainly put a smile on my face—and while I certainly think it's the right combination of quirky and clever to be one of this year's sleeper hits—I'll reserve all final judgement for the real thing.